any material, such as a thread or wire, used in surgery to tie off blood vessels to prevent bleeding, or to treat abnormalities in other parts of the body by constricting the tissues; see also strangulation. Ligatures are used both inside and outside the body. If one must be left within the body after an operation, the type used will usually be of animal tissue or synthetic material that will dissolve or become incorporated in the patient's own body tissue. Those used on the outside of the body for stitches of cuts or incisions can be of any durable material and are removed after they have served their purpose. Special instruments have been developed for the application of ligatures to parts of the body that are difficult for the surgeon's hands to reach or to work in. 1. A thread, wire, fillet, or the like, tied tightly around a blood vessel, the pedicle of a tumor, or other structure to constrict it. 2. In orthodontics, a wire or other material used to secure an orthodontic attachment or tooth to an archwire. /lig·a·ture/ (lig´ah-cher) any material, such as thread or wire, used for tying a vessel or to constrict a part. 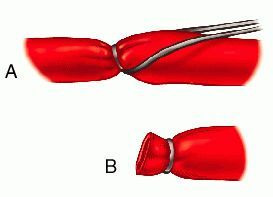 (A), Occluding ligature, which occludes the blood supply to distal tissue; (B), terminal ligature, which is applied to the transected end of a vessel. 1. The act of tying or binding. a. A cord, wire, or bandage used for tying or binding. b. A thread, wire, or cord used in surgery to close vessels or tie off ducts. c. Something that unites; a bond. 3. A character, letter, or unit of type, such as æ, combining two or more letters. a. A group of notes intended to be played or sung as one phrase. b. A curved line indicating such a phrase; a slur. c. A passage of notes sung by repeating the same syllable. d. A metal band that attaches the reed to the mouthpiece of the clarinet and related instruments. 2 a wire, as used in orthodontics. 1. A material–silk, gut, wire, etc used to ligate. 2. A tissue plus the ligating material. 2. orthodontics A wire or other material used to secure an orthodontic attachment or tooth to an archwire. Any thread-like surgical material tied tightly round any structure. Ligatures are commonly made of absorbable material, such as catgut or collagen, but may be non-absorbable. 1. In orthodontics, a wire or other material used to secure an orthodontic attachment or tooth to an archwire. 2. A thread, wire, fillet, or the like, tied tightly around a blood vessel or other structure to constrict it. n 1. a cord, thread, or fine wire tied around teeth for the purpose of holding a rubber dam in place on retained teeth with fractured roots or split crowns or on teeth that have been replanted. 2. a wire or threadlike substance used to tie a tooth to an orthodontic appliance or to another tooth. n a type composed of the fibers of a grass-cloth plant (ramie); used for minor tooth movement. It depends for its activation in movement on the property of shrinkage of the ligature when it is wet by the saliva of the patient. n a type, available as steel filaments in several useful diameters. any material, such as a thread or wire, used in surgery to tie off blood vessels to prevent bleeding, or to treat abnormalities in other parts of the body by constricting the tissues. one in which the ligature material is passed around the vessel and surrounding tissue twice before being tied.